I always get excited when holidays approach! In many ways, I celebrate so much differently now than how I did before kids. I try a lot harder now to have fun food, drinks, crafts, games, and more to do with the girls. We usually have other kids over too, so it makes it more exciting to make a creative treat for more people! Independence day is one of our favorite holidays because it’s not only great weather to be outside but also, it gives us a chance to show our girls how to be patriotic. It reminds me of my fun childhood by the lake, with family and friends, watching fireworks… it’s one of my favorite holidays! As for snacks, it can be tricky with toddlers. 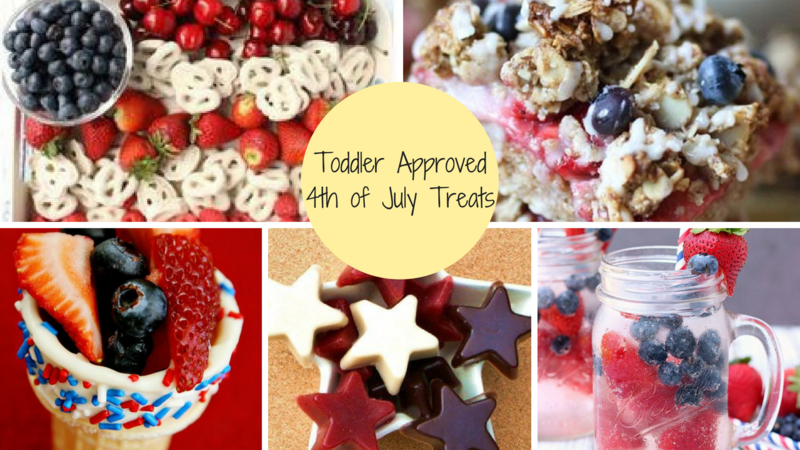 With the red, white, and blue theme, there’s so many things you can try that even the pickiest of eaters with enjoy it! Chocolate chips as a food review, what? I know it sounds a little silly. 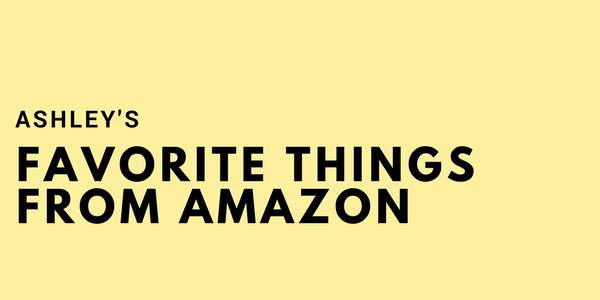 Perhaps you have your go to brand that you always buy. Maybe you’re not brand loyal in the least and are always trying new ones. 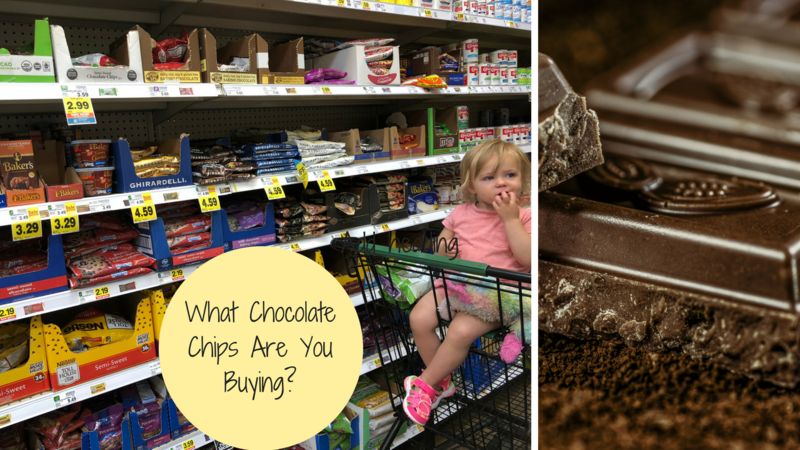 Either way, I feel it’s necessary to review because there are so many chocolate chips and chocolate candies with fillers, too much sugar, or things that could be unknowingly harmful to you, or at the very least, not as good as you think it is. If we’re going to splurge on chocolate (and let’s be honest, it’s worth the splurge), then let’s get the biggest bang for our health buck. "Your kids are such great eaters!" "I wish my kids ate as good as yours!" These are common statements I hear from other moms, either from daycare or just friends. Truth is, they don't have any other option but than to eat what I make for them. Thankfully they are only 3.5 and 1.5, and they have eaten this way since day 0, because I refused from the beginning to play the "short order cook" role. I don't have time for picky eaters. I could say the same thing about my husband. If he wasn't as happy-go-lucky as he is when it comes to food, he'd be SOL because he'd have to make his own dinner if he wasn't going to eat what I make for dinner each night. Thankfully, I do love cooking, I think I'm pretty good at it, and besides a few minor food avoidances, I don't have to worry about food allergies or anything like that. Packing Lunch for Your Toddlers. Part 2. Incase you missed part 1, make sure to refer back to it! 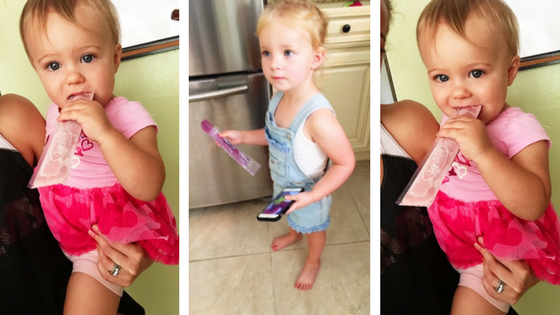 In this part 2, I'll share with you some examples of the lunches I've prepared for my girls! I personally use these containers from amazon because they are relatively inexpensive, I can buy them in bulk, dishwasher safe, they fit in their lunch boxes, it's okay if I throw them out, if they crack, etc. We don't heat them in the microwave, though they are BPA free. If something needs to be heated I put it in a separate container to be heated. 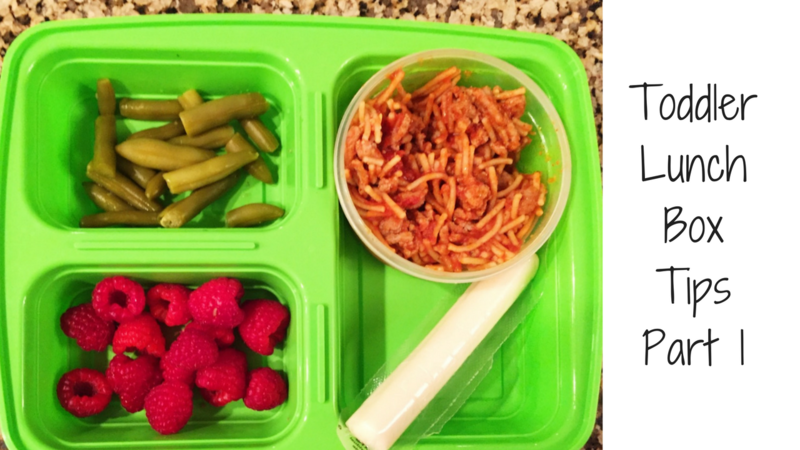 Here are 12 examples of our lunches in pictures! Comment below if you find this helpful! 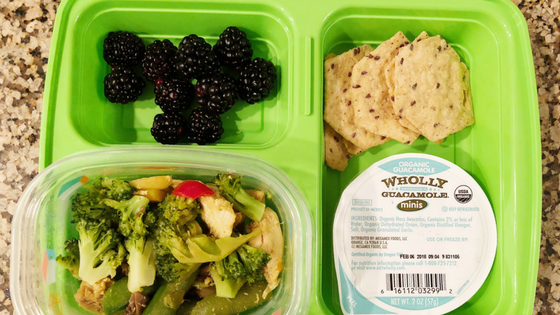 Leftover chicken & veggie stirfry, berries, nut/seed crackers, wholly guacamole packets. Egg & spinach muffin, raisins, fruit, and canned green beans. 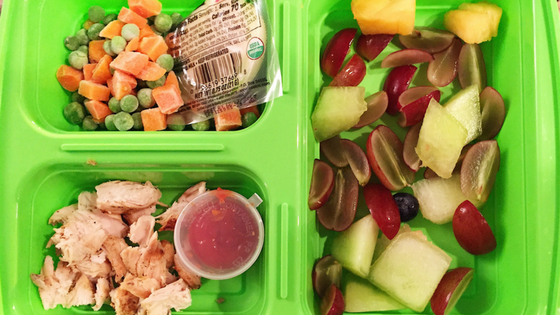 Frozen peas & carrots, organic cheese, baked chicken with ketchup, grapes & honeydew. 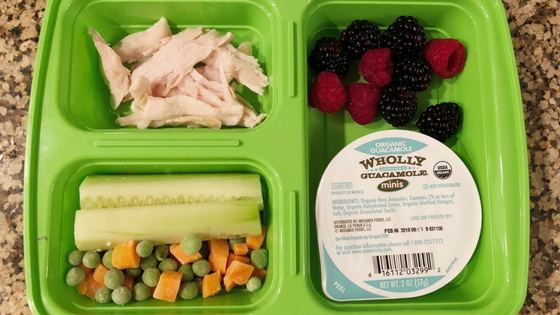 Shredded chicken, frozen peas & carrots, cucumbers, berries & wholly guacamole. 3 days worth for 2 kids. Packing Lunch for Your Toddlers. Part 1. 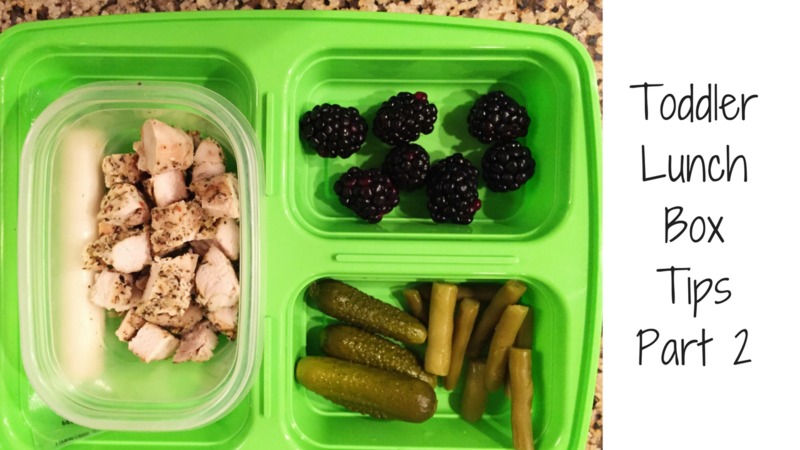 I love sharing what I'm feeding my kids (hence the passion behind Mommy Feeding Family), and I often share my meal plans, pictures and instructions for what I put in my kids' lunches, and more on social media. If you follow me on SnapChat (@AshleySweeneyRD) you've probably seen those cute lunch boxes I use... sSo what’s inside of those lunch boxes? 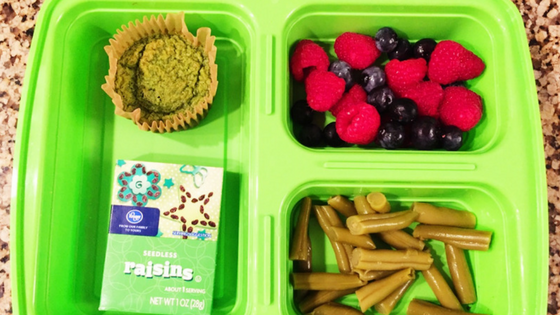 Deciding how to pack those lunches can sometimes cause some serious brain fog. 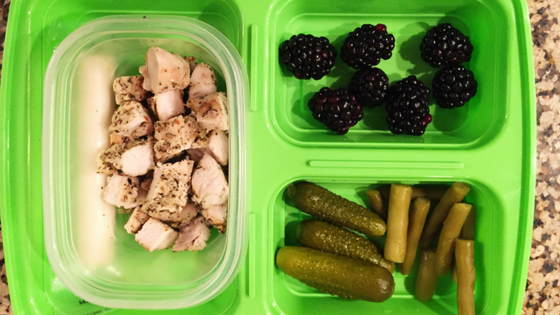 Let me help you navigate the lunch box dilemma! See Part 2 for examples! Get your lunch boxes ready. Plan your family dinners for the week. 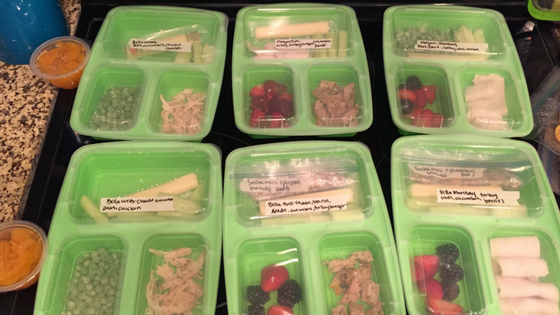 Determine which dinners would make for easy leftovers for lunches (for yourself and the kids). 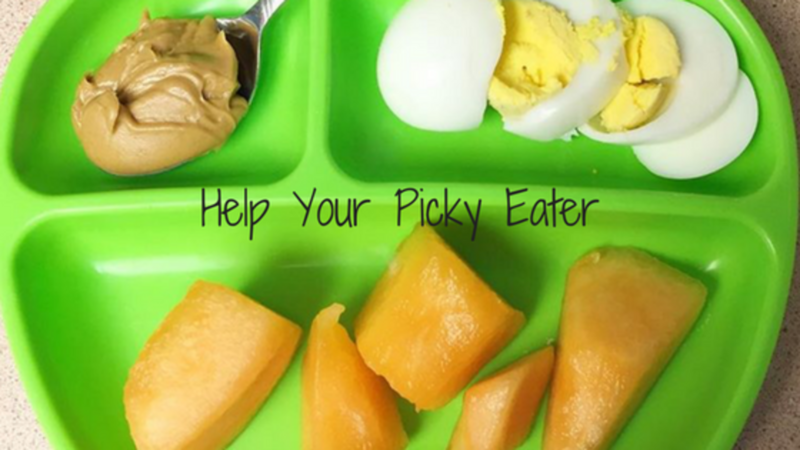 Wash, dry, chop and portion veggies into individual serving baggies or lunch boxes. Keep extra veggies washed & chopped in the fridge for easy after school snacks. 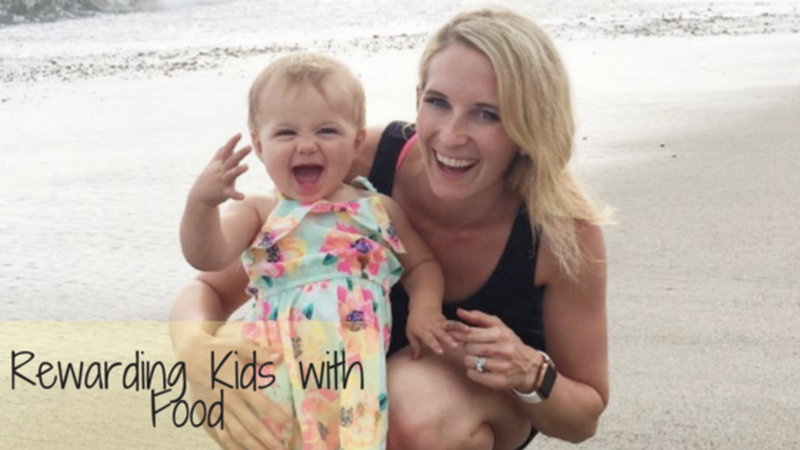 In a recent blog post, I shared my advice about not using food as a reward with your child, and how to enjoy treats around the experience, not the food itself. 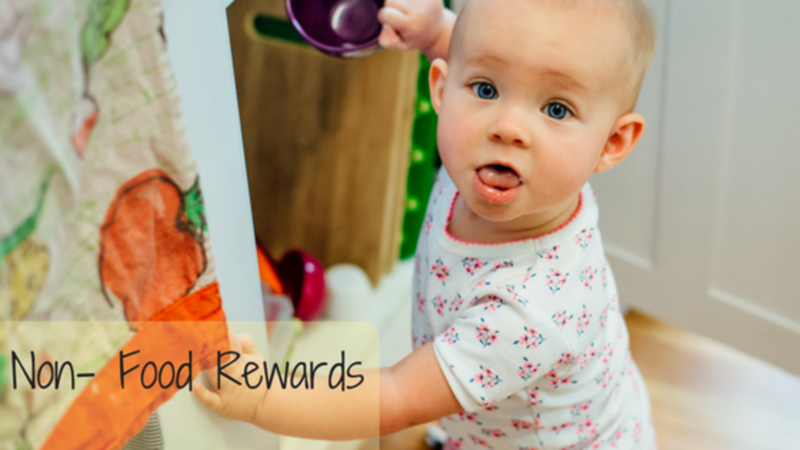 Today I'm sharing a list of some of my favorite non-food rewards that you can try to use with your kids! 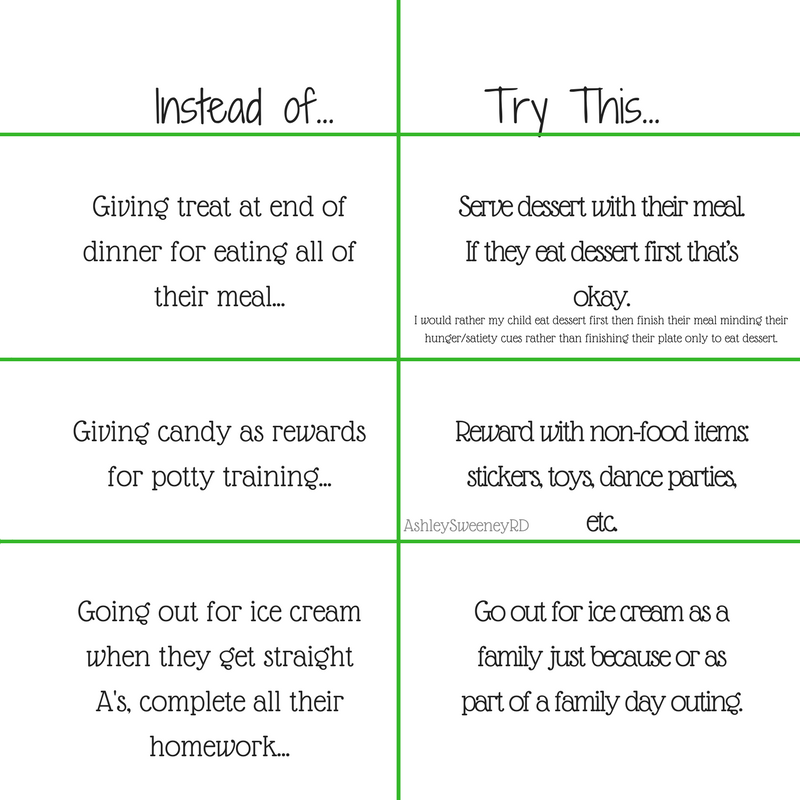 Use in place of candy or treats for positive behavior! Too often food is used as a reward. “If you go put your shoes on right now, I’ll give you a cookie.” Since we know our kiddos love a sweet treat (and who can blame them?! ), we as parents often use it to our advantage, because let’s face it, it works. What ends up happening is the treat becomes a reward and gets put on a pedestal. When in reality it should be treated as food, not a trophy. The goal here is not to avoid treats, but give our children the foundation for a healthy relationship with food, all food, even brownies. Below is a chart of common ways food is used as a reward and maybe what to do instead. There is too much sugar, artificial sugars and mysterious ingredients in the store bought kind. Teagain is teething, bad, and she loves anything cold and frozen! Put all ingredients in a blender, I use the Vitamix, and blend til smooth. 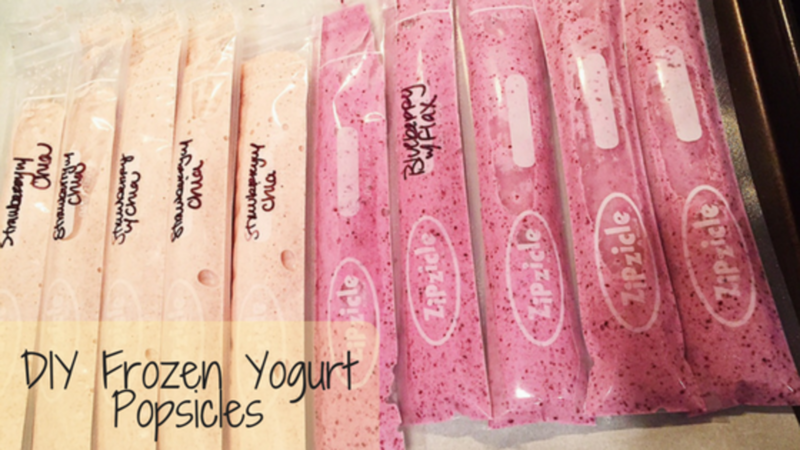 Use a funnel to pour ingredients into Zipsicles. My recipe made about 5 popsicles of each flavor. Freeze laying flat, then once frozen put in large zip lock container. Scroll down to watch one of my live videos from my Mommy Feeding Family group in which any mom can join for free! 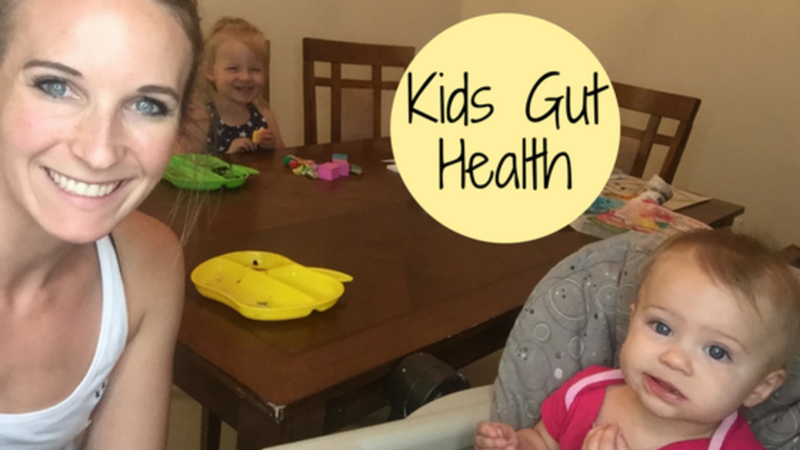 I shared 5 ways to improve your children's gut health! 1. Reduce inflammatory foods in your kids diet. Sugars, processed cookies, candy, juice, inflammatory oils, etc. 2. Get outside and stop sanitizing everything. Bacteria, good and bad, live everywhere, and exposure to all kinds are good for our gut microbiome. There is certainly a time and place for bleach, but every day hand sanitizer is not doing you any good.